Tea, tea and more tea please. Tea? Yes, please. I love tea. Always have, always will. I'm not even human until that mug of hot nectar is in my hands first thing in the morning. It's so versatile, black tea, green tea, salted caramel tea, fruit tea..... 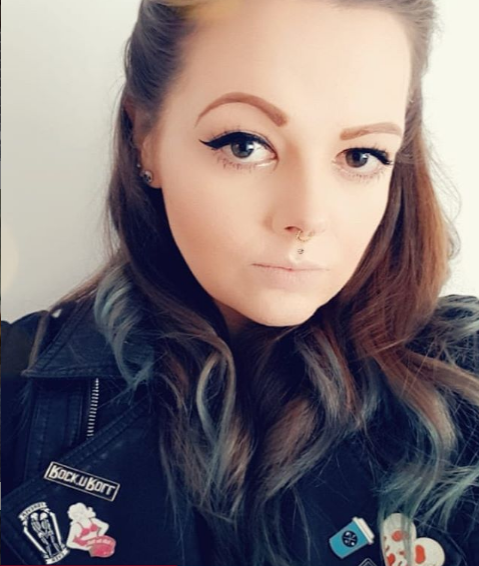 I'll have it all thanks. So when I was offered the chance to be sent this fab monthly box from Tea Tourist, it was no stretch of the imagination that I jumped at the offer! Now I'll admit over the years I've been called a tea snob. I do tend to lean towards the more expensive tea such as Fortnum and Masons, Jadu and other artisan brands but life is too short to drink rubbish tea to put it frankly. You may think I'm being snobby but just how much would you pay for a decent hand crafted coffee? How much are your coffee machine refills? 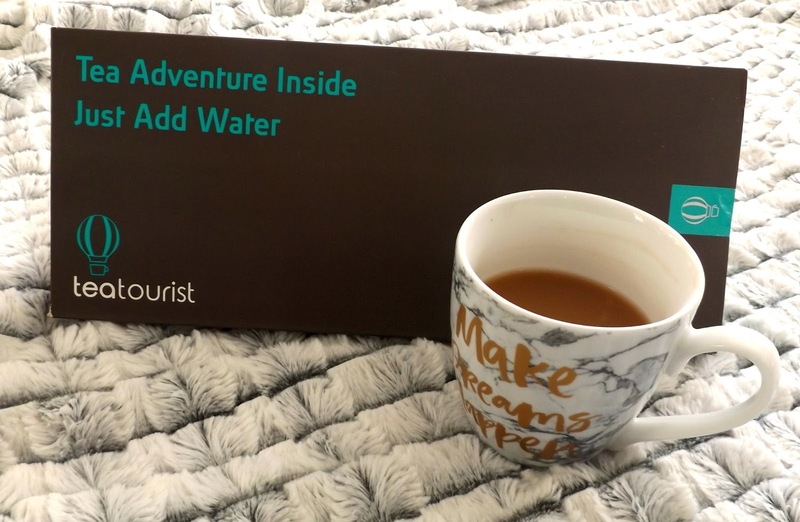 SO, what is a Tea Tourist box? Well my little tea leaves, it's a fab box that arrives in the post every month with 6 different loose tea samples. Each sample is large enough for a good 3-4 brews, so you can really try a tea and see if you like it before purchasing it again. 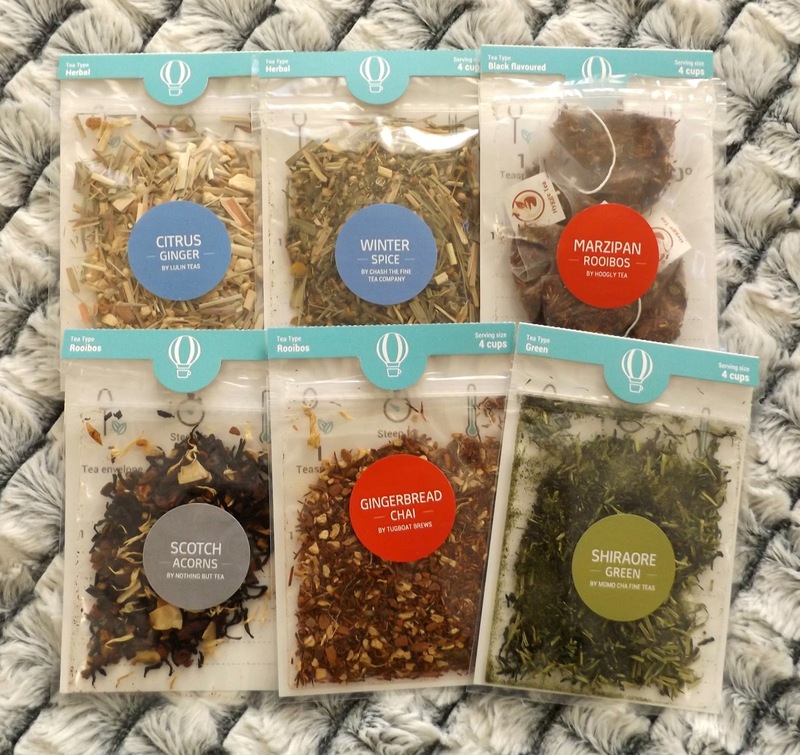 Each tea comes with it's own instructions on how to get the perfect brew, some information about the company, ingredients and they all come in lovely resealable pouches. All this in a lovely letter box sized parcel that appears if by magic on your door mat. Perfect. I'm a bit late reviewing this one, but as my little man made an appearance and never wants to sleep, I've just not had the time to dive into my December box! Thankfully with Stew on paternity leave, it gave me a chance to not only have a few lazy breakfasts with some new tea but actually get a hot cuppa which has seemed a million miles away since his arrival! In the box there was, 5 loose teas and 1 tea in bags, 6 different companies and 6 completely different experiences. This box contained Marzipan Rooibos by Hoogly Tea, Scotch Acorns by Nothing But Tea, Winter Spice by Chash The Fine Tea Company, Gingerbread Chai by Tugboat Brews, Citrus Ginger by Lulin Teas and Shiraore Green by Momo Cha Fine Teas. Obviously, this box contained ones I was crazy about and ones that I didn't like as much, so I'll start with the ones I adored. 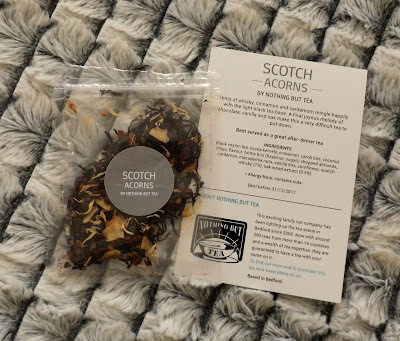 Scotch Acorns by Nothing But Tea. Oh dear Lord, basically. I wasn't sure what to expect but this is my favourite from the box, whiskey, cocoa, black ceylon tea, brittle, coconut, vanilla, almonds.... what's not to like? Once brewed this gorgeous black tea is a pure delight, with a hint of whiskey to start and finishing on a sea of cocoa, vanilla and oak wood. It's a seriously gorgeous tea and contains so many ingredients I love. You can keep your pumpkin spiced lattes, I'll have one of these thanks. I love a good chai tea at the best of times but add gingerbread to the mix and this is a true winter warmer you just can't put down. I had mine with milk and sweetener and it was gorgeous. Rooibos tea, vanilla and ginger make this a chai with a serious difference all this plus it's high in antioxidants and caffeine free. This herbal blend of rooiboos, almond, vanilla and mallow flowers is the tea that comes in a tea bag. As much as I do love a loose tea, the ease that a bag offers does get a thumbs up from me. 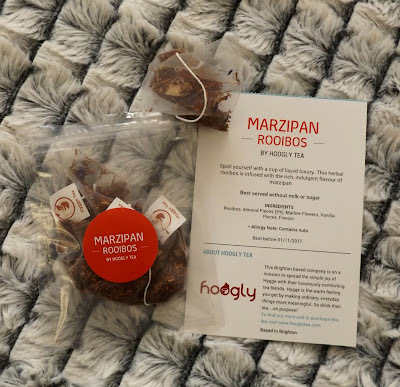 This utterly beautiful blend tastes just like marzipan, that sweet nutty taste is perfect and is best without milk or sugar. 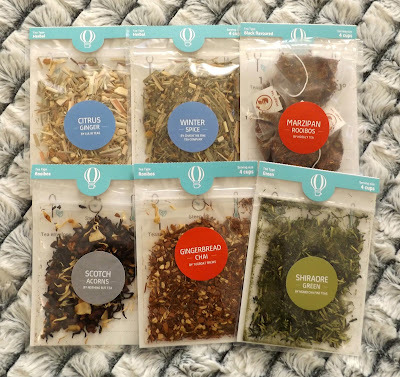 It really makes a nice change and offers something totally different to your tea collection! 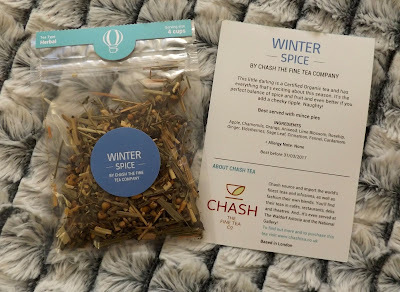 Certified organic tea, spice, fruit and even comes with the suggestion of eating it with mince pies. How could I not like this one? Apple, orange, lime, aniseed, ginger and fennel are just some of this unusual blends ingredients that all mingle so perfectly together. This is one you could pull out every Christmas and just the smell would give you those feel good winter memories from Christmasses gone. 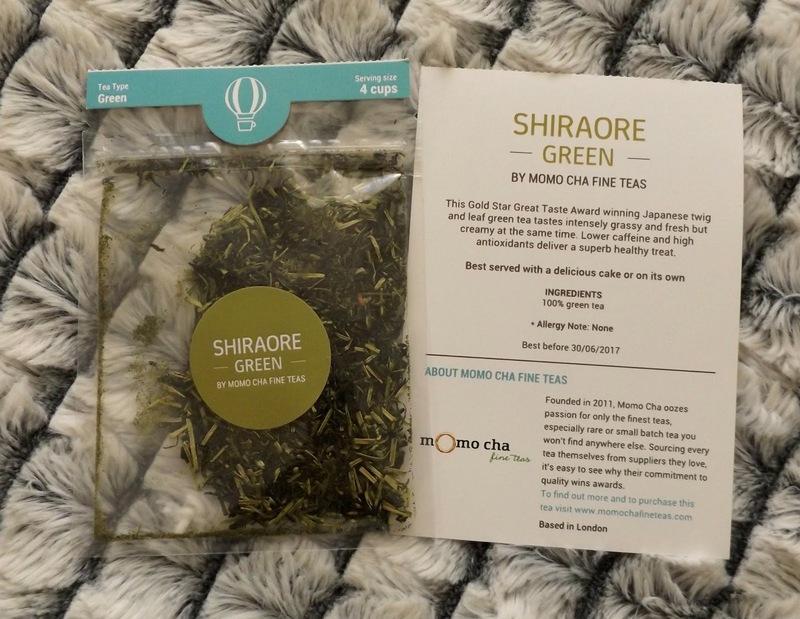 An award winning Japanese twig and leaf green tea with low caffeine and high antioxidants. It contains nothing but pure 100% green tea and offers a proper green tea hit. I've never been the biggest fan of green tea, despite all the rave reviews and amazing health benefits but this makes a nice change to my favourite black tea. It's a lovely fresh taste, that's perfect for those mid morning or mid afternoon pick me ups. Not only is this 100% caffeine free but it's a 2 star Great Taste Award winner! 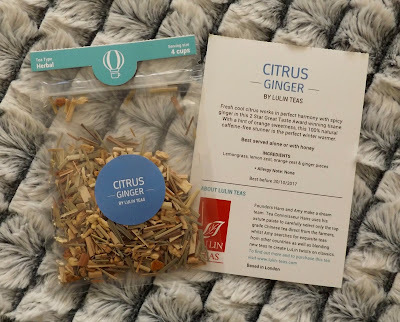 Now this was my least favourite of the box but not because it's a bad tea, simply because I'm not a massive fan of ginger or citrus tea. This blend of lemons, orange and ginger offers a zingy tea with a spicy kick. I added a fair amount of honey to mine, which would be the only way I'd personally drink this but I think I'm going to try it next cold. If you like ginger or lemon, this really is the one for you. So there we have it, a box stuffed to the brim of tea which makes me stupidly happy! If you love tea, you'll adore this monthly which not only won't break the bank at £14.95 and as a plus you won't have a cupboard full of sample sized skin care you don't use either! What one do you like the sound of best? Oh my goodness, this looks like heaven! Looking into Australian alternatives (and how to ship that Scotch Acorn into the country) right now! Oh wow such a great idea! I did not know such a thing existed! Where do I sign up?!! 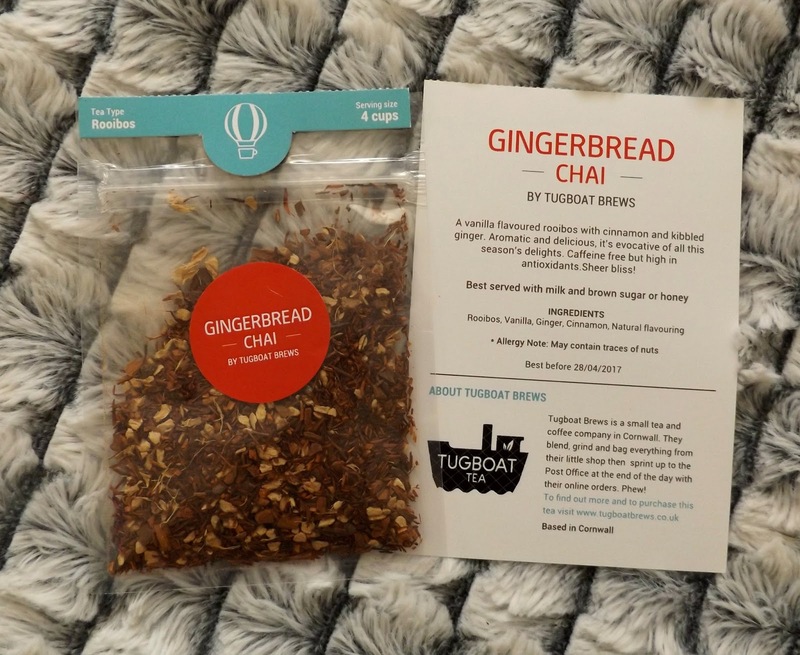 lol The gingerbread chai sounds amazing! Hey John, Joss here from teatourist. I love good artisan tea. So annoyed that I'm not allowed to drink almost any tea at the moment. My list was the same as yours but completely reversed!!! My favourite by far was the citrus ginger, it was crisp, clean, natural and with a nice fire from the ginger. The scotch acorns was by far my least favourite, though I didn't like either of the rooibos either, all I could taste was the flavouring and they tasted fake and unnatural. The singapore green was far from the favourite green tea I have ever tried, but at least it was pure and natural tea. And I liked the winter spice but found the sage a little overwhelming.